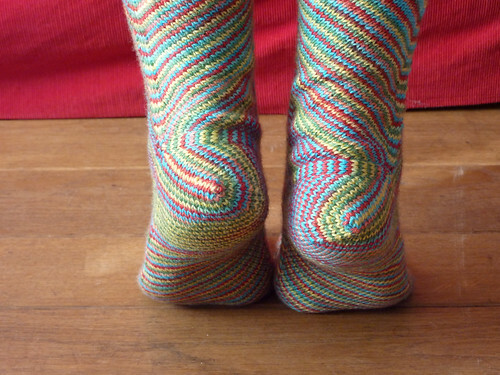 Earlier this week I finished my Skew socks. Aren’t they fun? They are, as I think I’ve said before, a little loose. I should really have knit them on 2.25mm needles instead of 2.5. Ah well. They fit certainly well enough and I will definitely wear them. I’m also tempted to dye some more yarn in different colors and knit them again. The way I dyed the yarn was just perfect for this pattern. The yarn only pooled a little around the ankles (blue and red together, yellow and green together), but that’s hard to avoid I think, unless you cheat and cut the yarn. These would also be great as knee socks. Maybe next time. In other knitting, I’m working on my second Glitten mitten. Even though Spring has sprung around here, it’s still chilly enough to want something on your hands in the morning, especially when you’re on a bike. I think I’ll finish them before the end of the month so they will count full points for the Nerd Wars competition. Photos coming soon!